Woody Allen says if you travel faster than the speed of light, you’d lose your hat. What happened here, then? Delish! I am so quick to get things on and off the needles these days. What is wrong with me? Oh, it may be the insane cold-snap whirling its way through Boston at the moment. Last night downtown along Canal Street, not a soul was out…Sully’s Tap was basically empty, and The Fours was quiet but a good quiet, the kind of quiet perfect for those willing to bundle up and brace the cold for a Black and Tan. 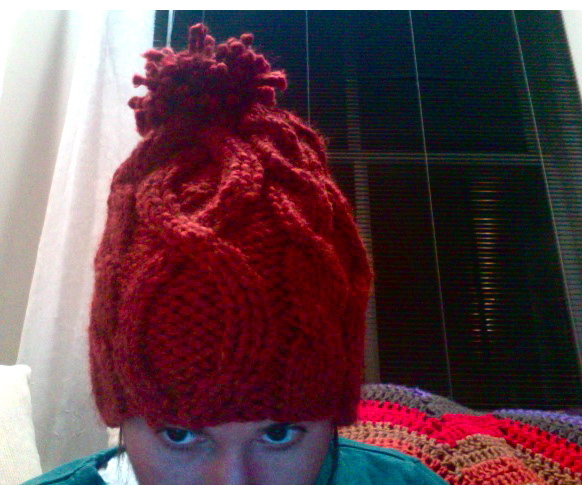 That being said, I finally finished the “Unoriginal Hat” by The Yarn Harlot, but of course, I put my own twist on it. I was originally going to put earflaps on it but because I increased the gauge and the yarn size, I decided the effect I was trying to achieve would not look swell with some ear flaps, but instead just a straight pom-pom affixed atop. 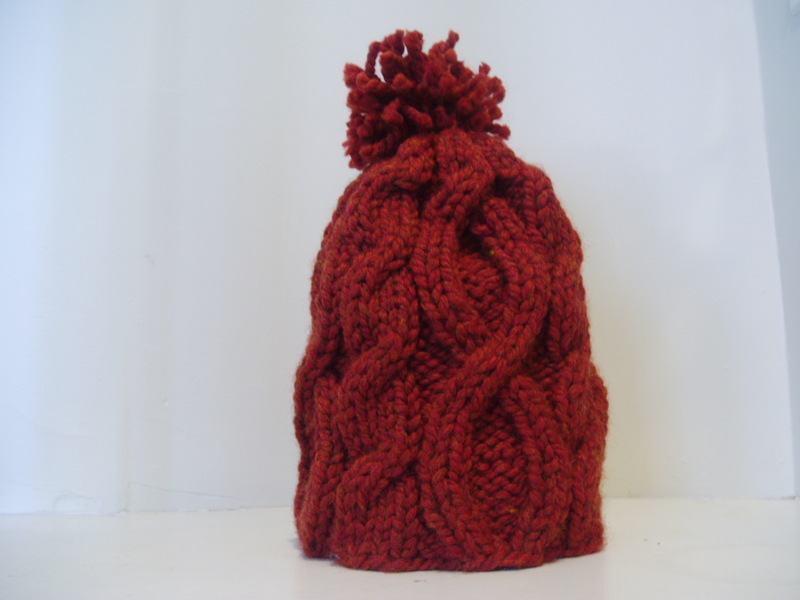 I increased the cabled and worked a different decrease so the hat is long and elfin like. I adore it. It fits perfectly, does not slide off the head, and the elfin pointy top does not fall…it stays straight on end and absolutely adorable. The cabling looks more elaborate than it is (with these open and close O’s and the standard two-stitch crossover) but it looks amazing on a hat. I’m incredibly pleased despite my hesitation while making it. I was afraid my adjustments wouldn’t work out and I’d either never gift it out or wear it, or perhaps yank the entire thing out. I couldn’t be more suprised at my newly found alteration skills. Ususally, I mess it all up. What do you guys think? I plan on making these for everyone I know as a Christmas gift. It took but a day and the yield is high. I’m sure they’d make excellent Christmas morning stocking stuffers. Yes? 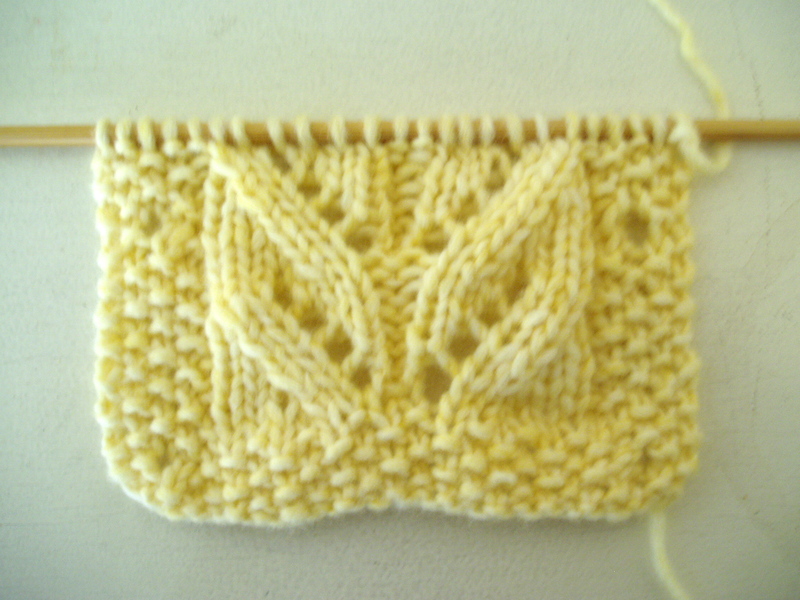 I am so pleased with how well the leaves and lace panel is coming out for the Presto Chango Sweater. The button holes run up the seed stitch border pattern, making them nearly invisible which I like so much. I’m nearly done the panel–just two more repeats of the leave pattern, which shouldn’t take but a bit more of the afternoon. But what does everyone think for the buttons? There are four of them along each side of the outside border of this panel….should I go with a bold color or keep it simple and do a variation on white/off white? Shiny? Flat color? I was almost thinking, it may sound strange, but a red, yellow, or green colored button may make this sweater pop. Still, I don’t know if they will take away from the gorgeous lace pattern…no button should ever outshine leave panels….if it were straight stockinette stitch, I’d say it would need the punch, but in this case, maybe it doesn’t? Suggestions needed before I purchase the buttons tomorrow! Presto…Chango? Nope, Presto Almost Finished-O! 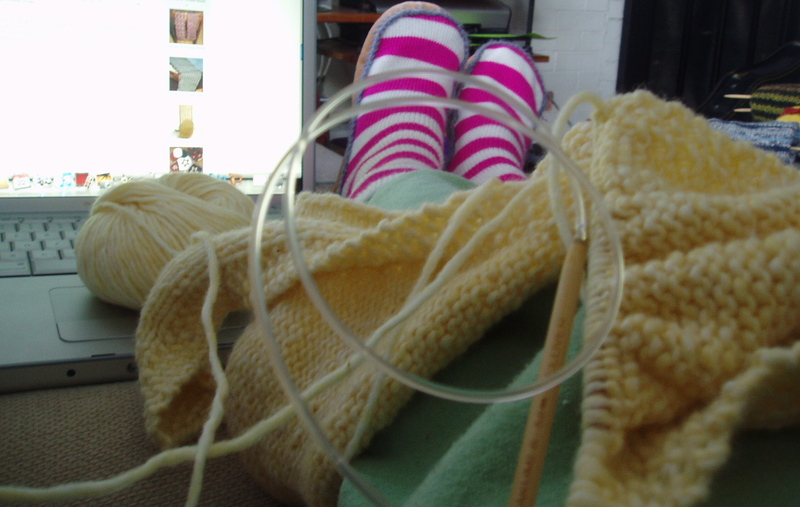 Saturday mornings, especially in winter, are the best times to lay around and knit. There isn’t enough white space here in which I can drool all over the laying about the couch in slippers, a full coffee mug, an incredible night’s sleep under the belt, and a knitting project on the sticks. That being said, as the wind was howling like crazy this morn, I sat about my couch and finished (yes finished!) the entire back, sleeves, and sides of the PrestoChango Sweater I’ve been working on for that baby shower next weekend. I got the right sleeve and side done last night while my friend Esteban and I gorged on Chinese food, watched the Bruins game, the opening 40 of Superman (the only good parts), and of course, our favorite, Whale Wars, which had a billion trailers with comments about how “compelling” and “entertaining” it is, written by who knows who at our ye ole newspaper of employment, The Boston Herald, which of course, made us chuckle as much as we could before we felt we might vomit from over eats. Alas, I was too full to make any significant dent in finishing, which I fixed for myself this morning. Now, all that’s left is the panel front, seaming up the sleevs and sides, and affixing the eight buttons to the front. Woo! Expect me to post the final product in the coming days. File Under: I wish I were a baby right now so I could snuggle in this sweater. 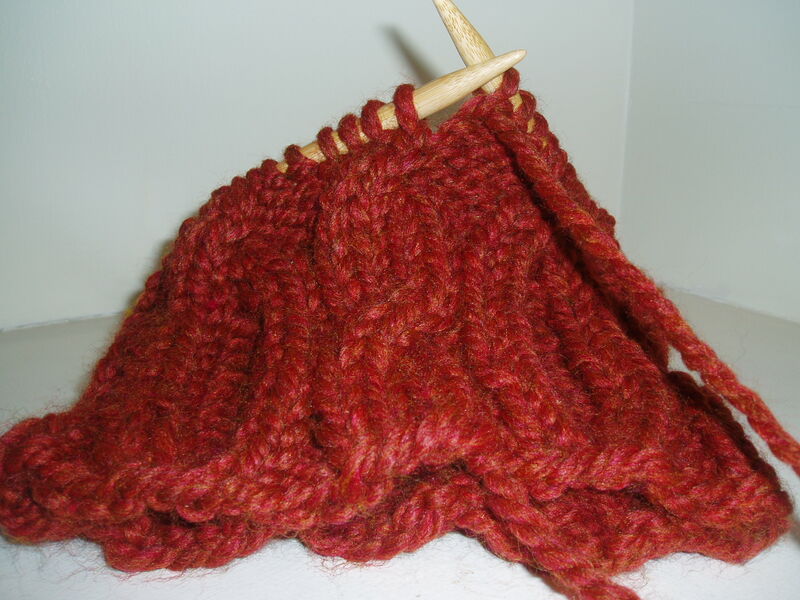 Last night, I decided to cast-on a really quick earflap cabled hat with tails, because, why not? Clearly, I have knitting A.D.D. though in my defense, the baby sweater I’m working on is so close to being done, I feel I am at liberty to flex my knitting muslce in adult-wares. That being said, I found this cabled hat on Ravelry and decided I must make it with earflap modication because who doesn’t like a good earflap hat I ask? I’m still debating on whether to afix a giant pom-pom to the top but I think I may make this one less kitsch than I’m know for since the spiced pumpkin color of the yarn is boom enough! 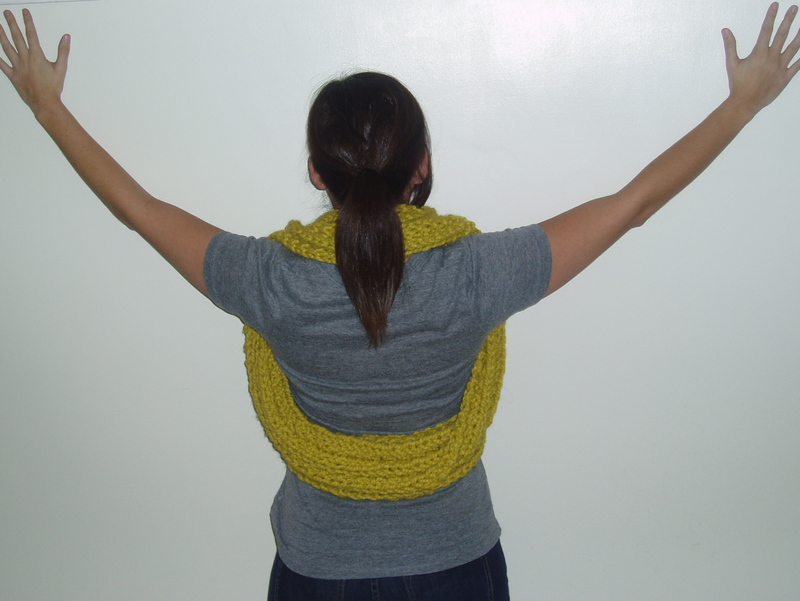 The cable pattern is really cool; a open and close circular cable and a large, chunky, standard two stitch cable. Delish! I’m nearly done the hat and I cast it on last night around 10 p.m. after I was tapped out on schoolwork and the like, so that means this is an excellent last minute holiday project or “I just need a hat in a jiff” kind of instant gratification. Sorry to all the non-Ravel users who can’t see this pattern. I’m sure to finish it tonight watching the Bruins game and gorging on Chinese foods and beers with my good friend Esteban Miguel. I’ll be sure to post a final photo when its done. File Under: Herman Melville eat your heart out. This hat is perfect for a hat-knocking affair, and a trip out on the sea. 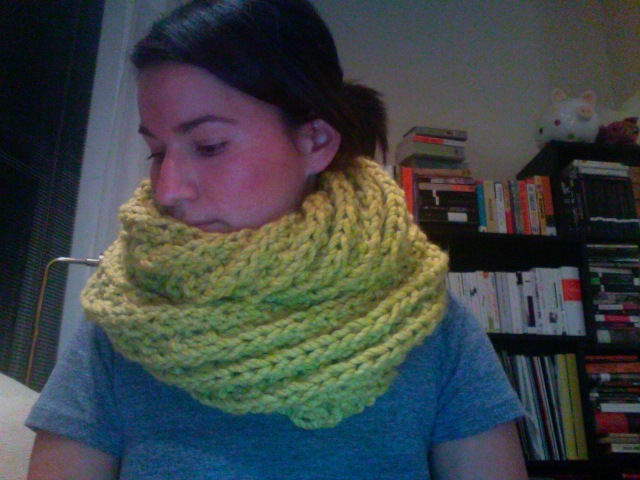 Full-Coverage Cowl….you’ll “cowl” into a corner if you can’t own one of these. 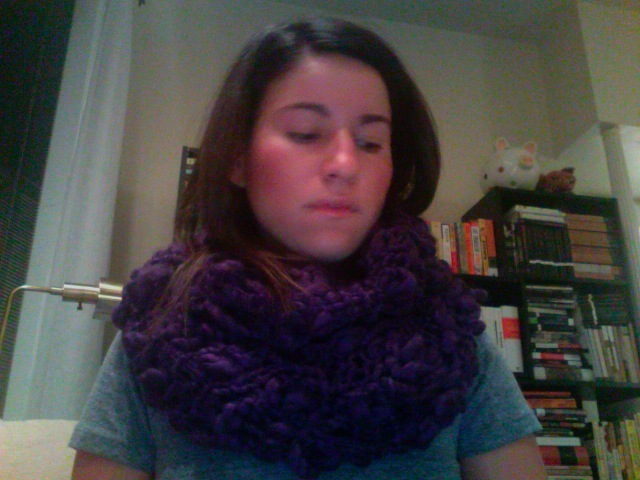 Can I please, please, please gush on how absolutely beyond satisfied I am of this extra chunky cowl I recently designed and knitted up? Not only is the brilliant yellow-green color phenomenal in person, it is so g.d. warm. I’ve warn it a couple of times since I completed it last week, and I have to say I couldn’t be warmer. The best part is you can wrap it around your neck a couple of times for added bulk, and while most cowls are simply decorative, this is merely warmth. Delish. 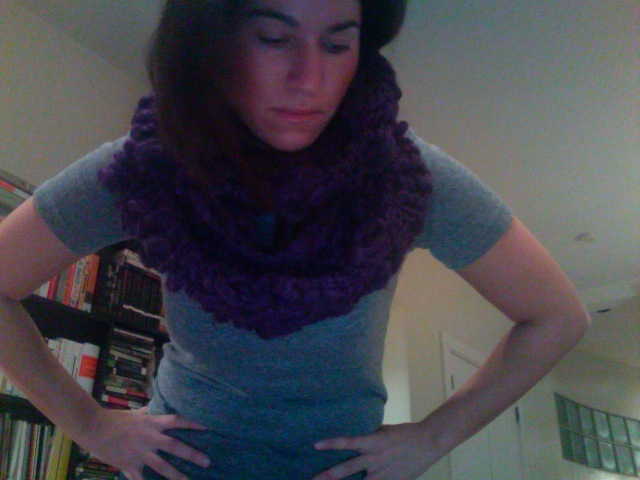 I like that I don’t have to fuss with the end of a scarf and try and keep it wrapped. This puppy never shifts out of place and not a single gust of wind gets up under it. I used a mock brioche rib stitch since I am currently too obsessed with this stitch pattern to use anything else…though I think this type of cowl would take to any kind of ribbed stitch. Plus, you can wear this baby a whole bunch of ways. So unitl then…start thinking about what color you want custom knit because they’ll eventually be available in my shop! Leather and lace? Nope, it’s not for Stevie Nicks…try Baby Alpaca and Lace. 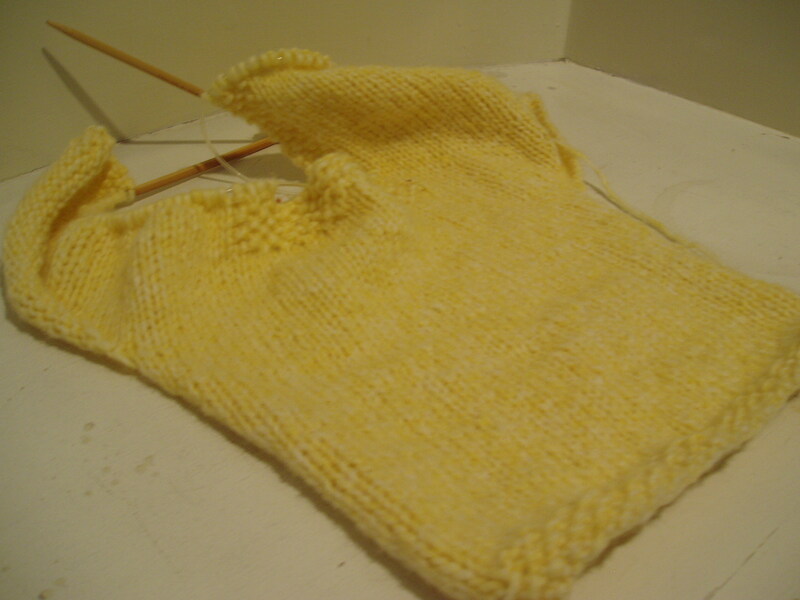 I am making serious progress on the Presto Chango Baby Sweater by Valerie Wallis, who runs the Shoeless Val blog. The sweater is absolutely adorable and practical because while I have no first hand experience in this, my Mum has told me its never fun to fuss with trying to get a baby into an over the head sweater. What’s cool about this one is this gorgeous leaf and lace panel on the front, which can be fully removed via four buttons on each side, rendering this sweater absolute ease to take off the fussy one. I’m making this for my future sister-in-law’s (yes! my brother Bryce got officially engaged, ring and all! Congrats to both him and Erin) now pregnant sister. 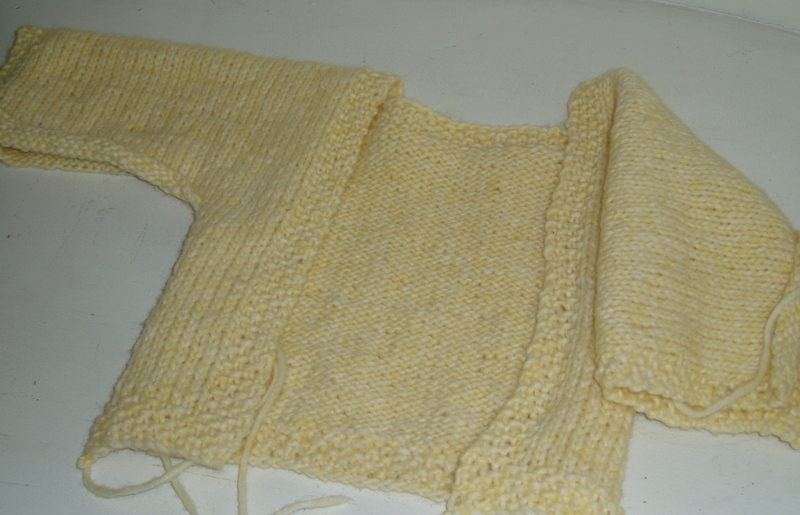 She’s having a girl and I decided to knit it up in this adorable pale yellow instead of the standard pink. And this is the SECOND sweater I’ve started for a baby shower that’s nearing and nearing. 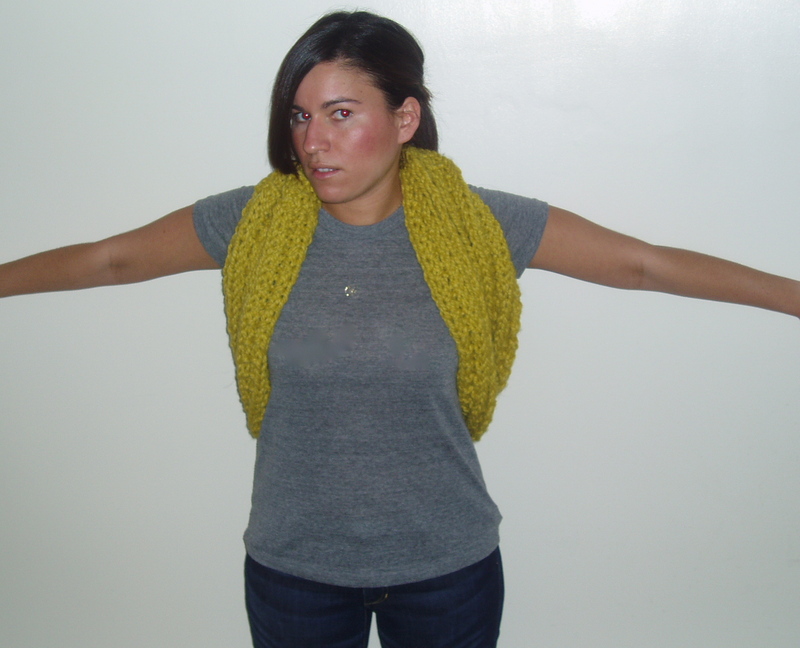 But this doesn’t have complex cabling and texture pattern like the last one I was working on, so I finished the entire back, the neckline, and nearly all of the sleeves in just two days! Remarkable! It’s all knit basically in one piece besides the front lace and leave panel, making this so easy! Splendid! I hate lots of seaming. Remarkably, all my stitches are nice and tight and so even, rendering me extra proud of myself. 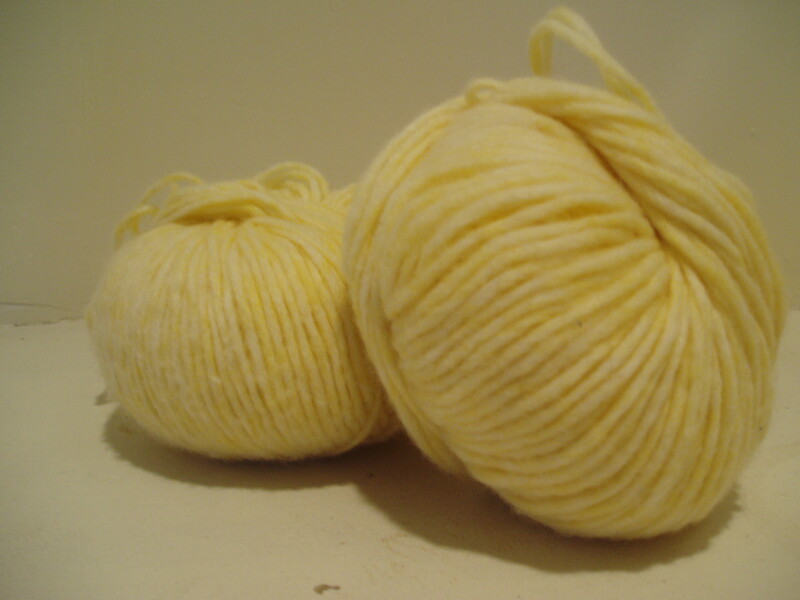 The pale yellow yarn is uber baby soft–a combination of baby alpaca wool and cotton, so tis perfect for babying because it can be washed. What’s more, I’m pleased that I’ve finally found a project for the three skeins I’ve had in my stash for at least two years. I’m making the size for up to 12 months old, so here’s to hoping it gets a little use. I’m nearing the homestretch and already got a few pairs of handmade booties knitted up under my belt, so I indeed am thankful I’ll actually have a gift in time. Last weekend, while giving my friend Sarah her first knitting lesson (to which she picked it up incredibly fast, managed to keep at it all week, and has had zero questions since day one! impressive! ), I decided to cast on and knit up a really quick super thick n’ bulky cowl, and I have to say the results are so yummy I couldn’t be more pleased. Using an extra thick extra thin in places yarn with an incredibly bold grape colorway that I randomly found three skeins of at some knitting store on clearance, I knit this puppy up on Size 35 needles using a simple garter stitch the whole way (it’s my latest addiction, this chunky garter stitch!) and seamed up the side. 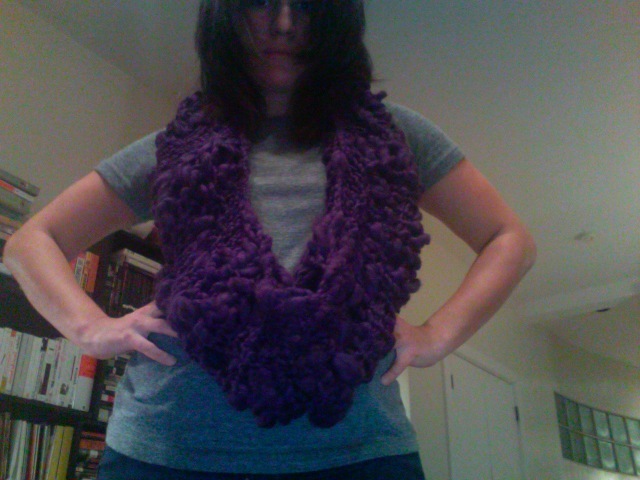 It can be worn like a necklace, too, only a giant chunky yarn necklace, or double wrapped into a tight neckwarmer leaving the possibilities and decisions about how to rock it innumerable, but its so cool nonetheless and when I wore it out to Sully’s Tap last Saturday night, compliments abounded. I have since decided to call it “The Great Grape Ape”, and I think the name suits. Expect to see me out and about in this neckpiece many a time this winter. I am hoping to find a similar yarn to this grape ape certainly, but apparently its a discontinued yarn and so I can’t get the exact one in different colors. Boo! But fear not. I will find an excellent substitute and be sure to knit up plenty of them for my friends–I know Sarah coveted one of these woolie wonders, and so, she gets top billing. File Under: Everyone else, take a number. 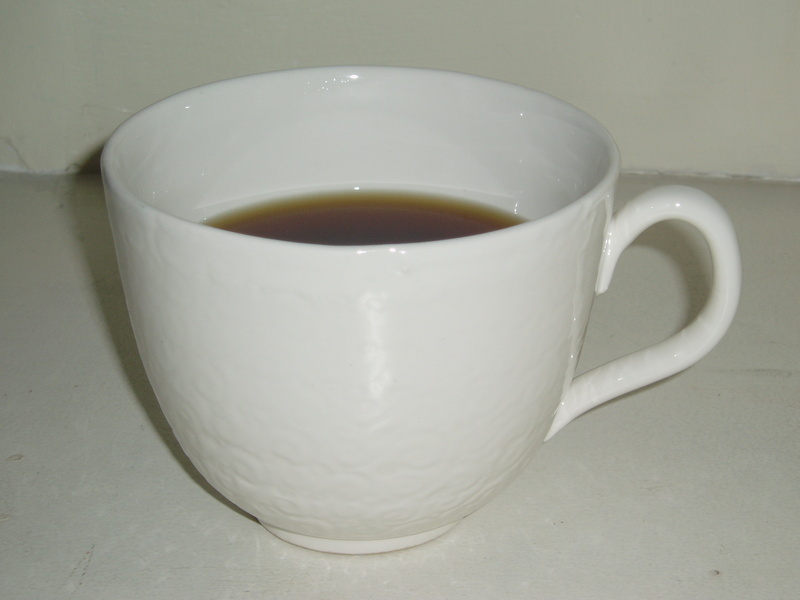 I’ll have a few cups of…beer? Cake? 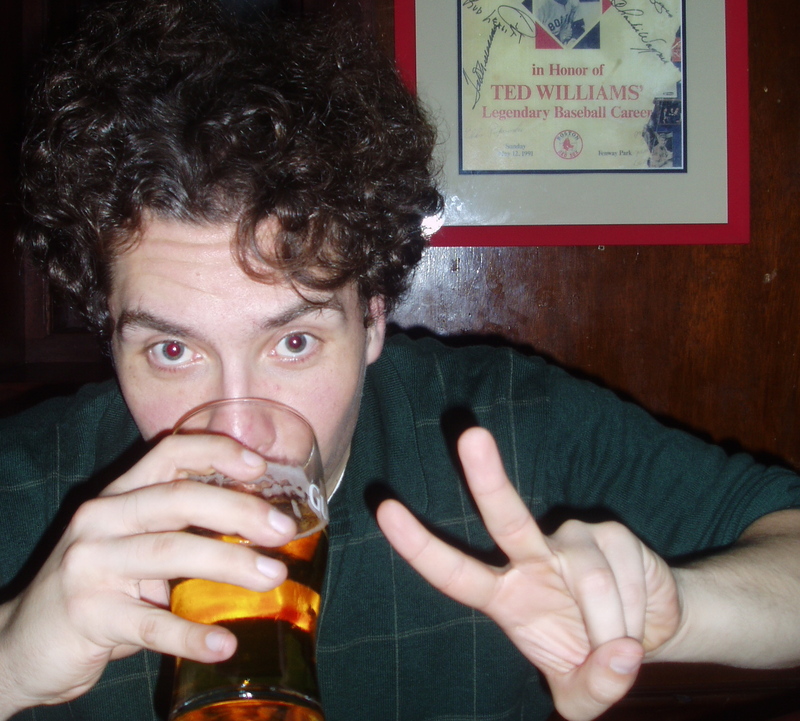 Beer? Cake? Oh heck, both? For some reason, cupcakes and beer seem like an ultimate combination–welp, at least for those who actually like these mini-cakes with fluffy homemade marshmallow topping. And so, I whipped up a batch of these babies last night to take along to Foleys Pub as random party favors…and boy were they a hit. Not only were the drinkies flowing, but these delicious sugary sweets really “hit the spot” at 2 a.m., or so says my friend Esteban Miguel, who was gifted his very own box o’ lil’ cakes which were a late night chaser to beers and burritos. The frosting is my favorite Marshmallow Fluff based heart attack waitint to happen, with butter flavored shortening, powdered sugar, and of course a splash of vanilla extract. 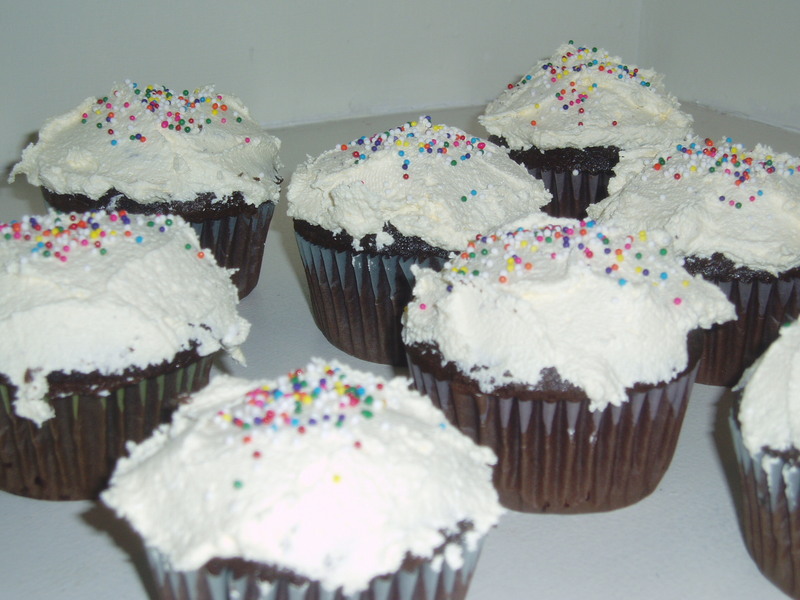 I often like to decorate my cupcakes with those rainbow non-perils and nothing more. 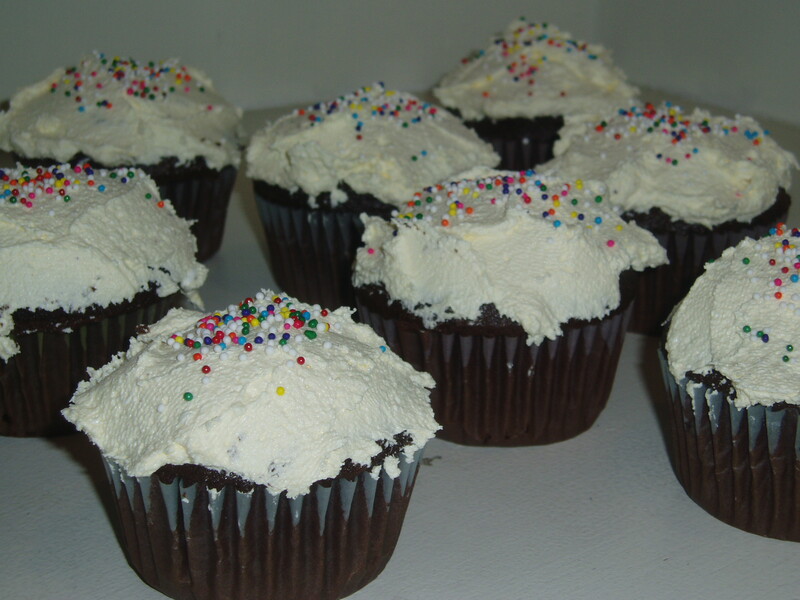 What can I say, I’m a simple baker. 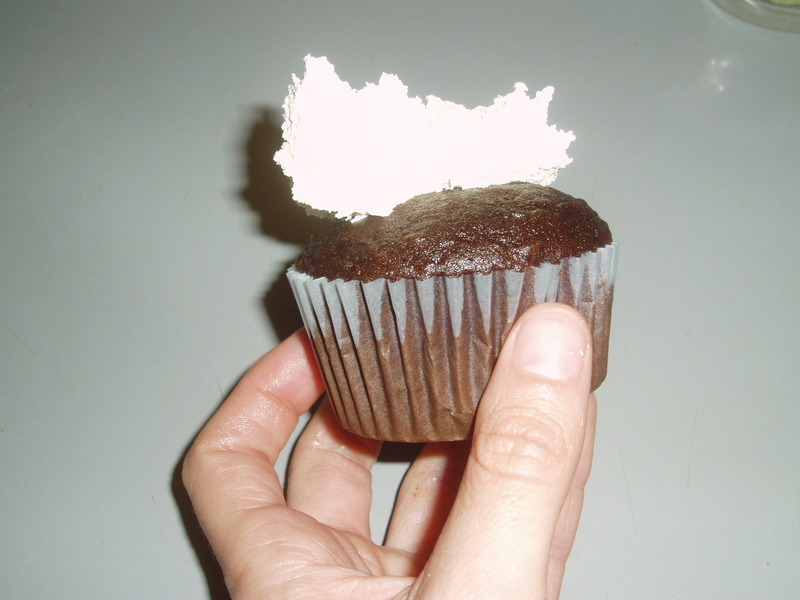 File Under: Bring Minicakes to any Boston Pub for a meet-up with friends. It’s um…genius. There’s nothing better than a quiet morning of coffee sipping, newspaper reading, podcast listening, and of course, finishing up some of those projects that have been on the needles just gasping to be bound off for ages. And that’s what’s happening in these parts of Boston, on a gray, foggy Saturday. It’s been unseasonably warm (60 degrees!) but spitting a light shower the last couple of days, and that always begs me to knit…but alas, I’ve been busy with school and work and haven’t had a chance to just block it all out and get my fingers working (still debating whether I can make this whole knitting thing a career one day!). 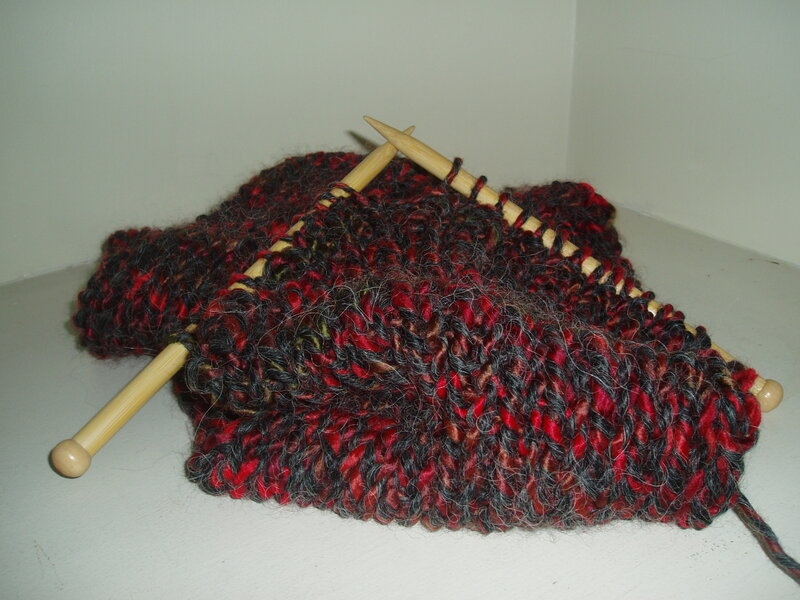 This scarf is being knit up with an absolutely thrilling red-gray-green-brown colorway that is so drool worthy in person, I want it for myself. Alas, its intended for another, and another will look splendid in it, I hope. It’s a brilliant cashmere-woolie and its the perfect scarf to show off in a dank, dark, Boston pub, which was my intended goal. Gush! I’m knitting it on size 15 needles with a simple K1P1 rib–this so the colorway isn’t lost in some elaborate pattern, and if you’ve ever wanted a scarf to appear stockinette stitch on both sides but don’t want to knit it in a tube and don’t want to block a scarf that will inevitabely begin to curl again in a few months time, this is the perfect knitting stitch pattern for you. The K1P1 rib keeps it flat and uncurlable (is that a word?) no matter what, yet looks like stockinette on both sides. Its beautious! And so, I hope you do as I do today…knitting pub scarves and sipping coffee. I highly reccommend you enjoy The Uncensored History of the Blues Podcast this morning, which has just done one on “President’s Blues”. I’ve written about it over at my first love, the music blog, Pulp and Circumstance, Juiced! if you want more information. My obsession with socks is clear. I always hated the idea of knitting them–I felt no one would wear them, or they were too pretty and intricate to be hidden under shoes. 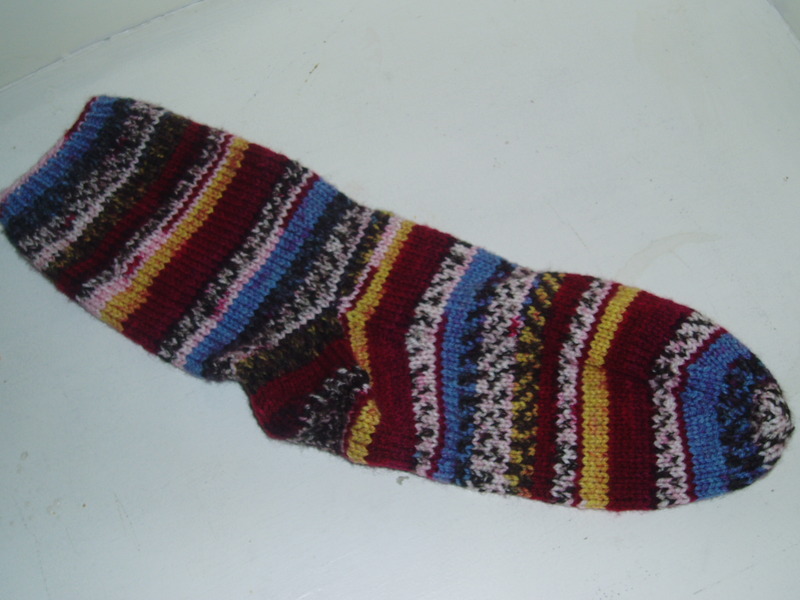 Or, quite frankly, that I never had the motivation to cast-on the other sock after I’d finished the first one. 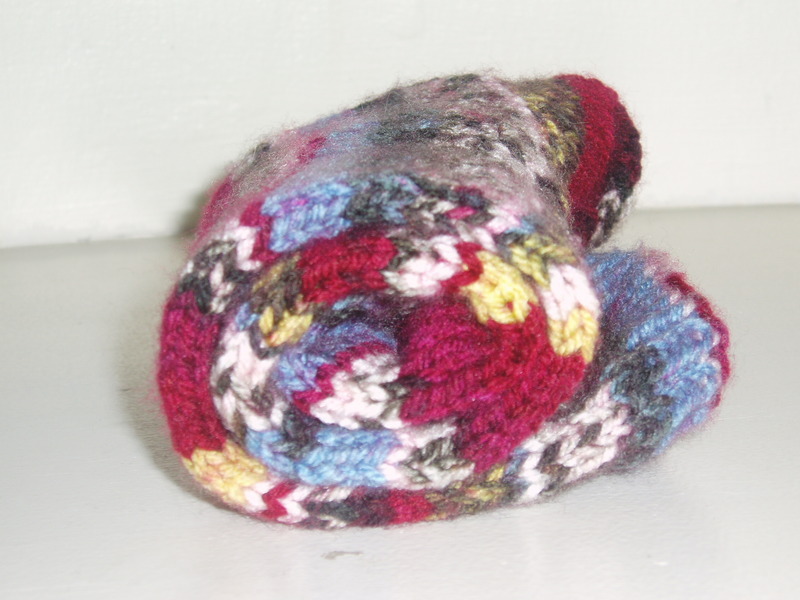 But, they are the perfect little knitting project to throw in your bag for on the fly knitting. And sock yarns are so delicious, I could eat them up constantly and never feel full. 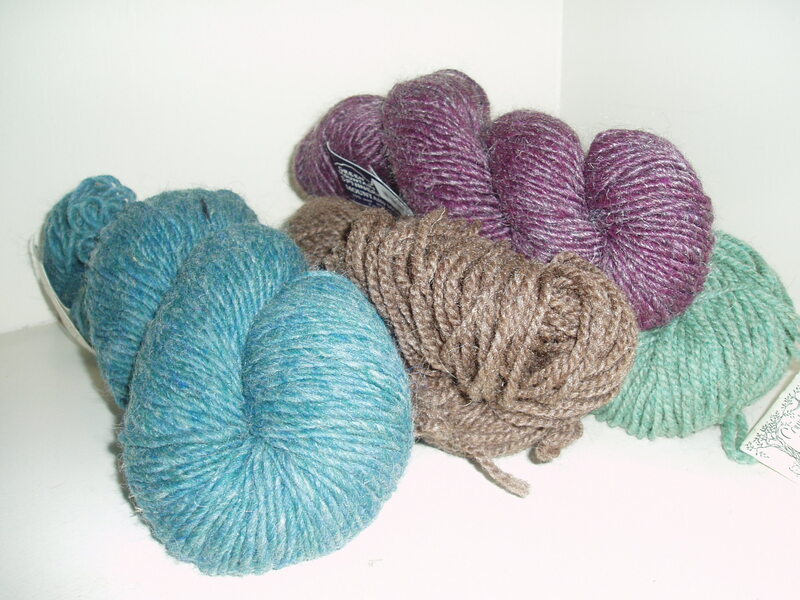 And one of the more exciting bits about going to visit your Mum’s house over the holiday weekend is to find a splendid number of handspun sock yarns in a bin about the basement that you totally forgot about. Yep, it’s Socktoberfest in November. I finished one of the socks I cast on, what, within two weeks of original start date? What is wrong with this picture?! Anyways, they are perfect. Whilst they look quite big in this photo, a measurement of sorts indicates that they will be the most fitting slouchy sock for a woolie fanatic. And the self-striping reds, blacks, blues, and yellows are a nice change from some of the more standard sock yarns in blues and greys. Because I was so pleased (considering this is the first set of socks I’ve done in regular stockinette in which I did not follow a pattern, cast on the amount of stitches I thought were good, and of course, adjusted the heel, instep, and toe stitches! 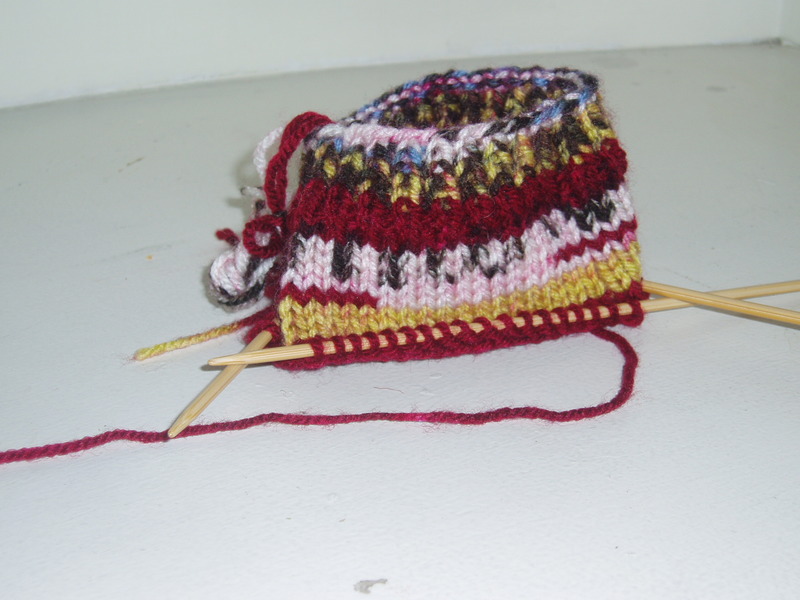 ), I decided to immediately cast-on the second sock (as I have a habit of getting bored and only making one). File Under: November most certainly is my Socktoberfest! Zap me up a…piece o’ that? Let them eat cake, is right. This cake, made entirely in the microwave, actually looks kind of unpleasant, but I may have to try it, just for giggles. Wired has the wiki directions, what you’ll need, and how to make it (clock that in at just under 6 mintues, I’d say), complete with instructional video. It’s a flour, egg, hot chocolate based cake, and when it actually gets dumped out the mug, it looks like a heinous ball o’ randomly zapped cake (akin to those boxed frozen microwave cakes my Mum used to randomly get back in the early 1990s even though we always decided they tasted like crap-o). But what do you think? Will you try it?